The Woom 2 14-inch pedal bike has quickly risen to its current position as my 3 year old’s go-to bike. (This is quite the feat considering he has a large enough fleet to make any bicycle addict jealous). In fact, he loves the Woom 2 so much that he insists we park it inside the house “where it is safe.” I don’t argue—it’s that nice. 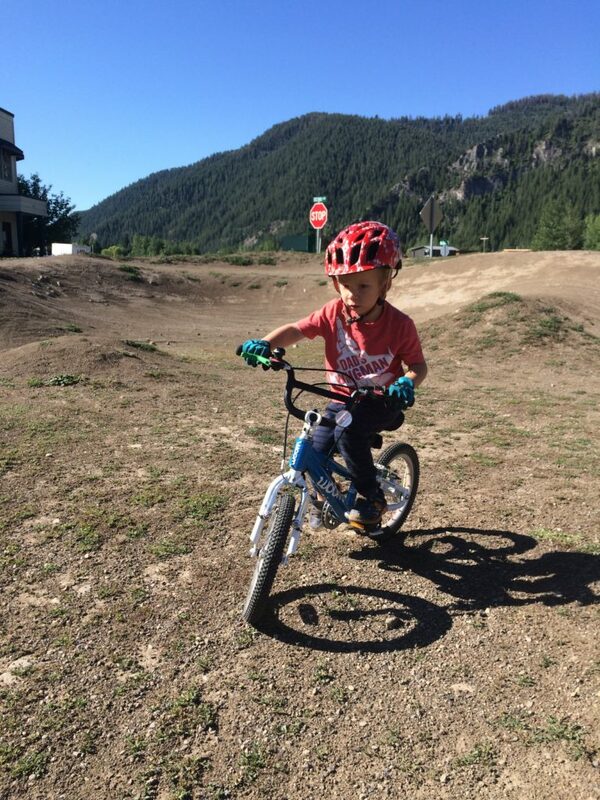 P has been riding a pedal bike since he was 2.5 (he’s 3.5 now), and that entire time we’ve had a difficult transition. Even though he was able to ride a pedal bike, he didn’t want to. He much preferred sticking to his balance bikes. In my review of the Specialized Hotrock, I mentioned that that bike was too heavy and the coaster brake was confusing to him. Enter the Woom 2. When it arrived, P was so excited to try it out that he was literally shaking. Luckily, it only took about 10 minutes to install the pedals and adjust the handlebars, seat, and brakes—and we were off. I’m not sure who was more impressed, me or the kiddo. Every time we passed someone on the inaugural ride, P would stop to tell them about his “cool new bike.” As for me, I’ve been blown away by how much faster, confident, and joyful he seems riding the Woom 2. This bike seems to have fixed our problems with transitioning to a pedal bike as he hasn’t asked for a balance bike once since he got it. 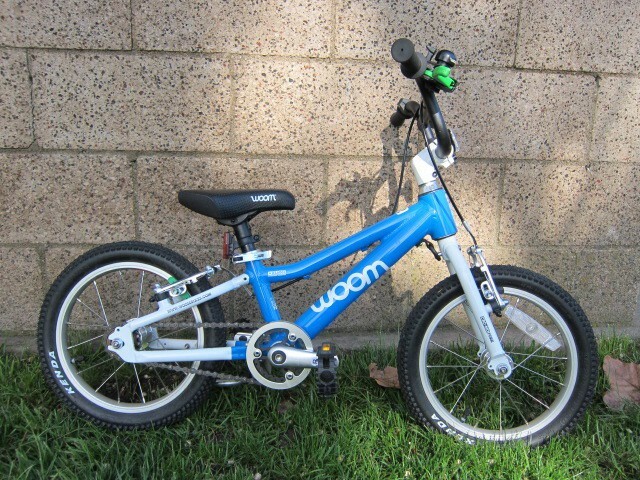 For anybody who is looking for a REAL BIKE for their 3 to 4.5 year old, I would highly recommend the Woom 2. In fact, I believe the Woom 2 is THE BEST bike for a 3 year old. From the Kenda tires to the color-coded brake levers, to the lightweight aluminum frame, every inch of the Woom 2 is perfection. Before I go into any detail, let me show you this short video of my 3 year-old riding. The Woom 2 has drastically improved his speed and confidence. The fact that P’s riding has improved on the Woom 2 is a result of the bike’s lightweight and intelligent design. The engineering behind the Woom 2 is what really makes it stand apart from other kids bikes. Every detail has been considered. The low bottom bracket and long wheelbase provide excellent stability. The standover height is low enough that kids can get on and off the bike easily and touch the ground with both feet when at a stop. The Woom’s geometry and wide, upswept handlebars allow for an upright riding position. This provides young riders with maximum control of the bike, easy steering, and the ability to focus on upcoming obstacles. Note the upright geometry, short crank arms, and long wheelbase. Perhaps even more important than the geometry of the Woom 2 is its weight. Tipping the scales at under 12 pounds (without the coaster), the bike is manageable for most young kids and weighs significantly less than nearly all other bikes on the market. P’s Specialized Hotrock, for comparison, was a whopping 15 pounds–which is exactly half of his body weight! The Woom 2 boasts 14” wheels which seem to be the perfect size for a first real pedal bike. Compared to the 12” wheels on the Hotrock, the 14” wheels have made a big difference in P’s ability to ride up and over obstacles. If you are trying to decide between the two wheel sizes for similarly sized bikes, I would definitely recommend picking the larger wheels. All Woom 2 bikes are outfitted with dual (front and rear) hand brakes. From there, you have the option of choosing between a coaster brake or a freewheel. Per U.S. law, the Woom 2 comes standard with the coaster brake, but for an additional $19 you can also purchase a replacement rear wheel with a freehub. For us, we decided to forgo the coaster completely. We already knew that P was capable of using a handbrake (his balance bike had one), and the coaster on the Hotrock both frustrated him and caused skidding when riding off-road. If you need help in deciding which option is most appropriate for your child, read this article outlining the pros and cons of both. I almost squealed with delight when I saw the color-coded brakes on the Woom 2. The right (rear) brake lever is green, as are the rear brake pads. The left (front) lever and brake pads are black. 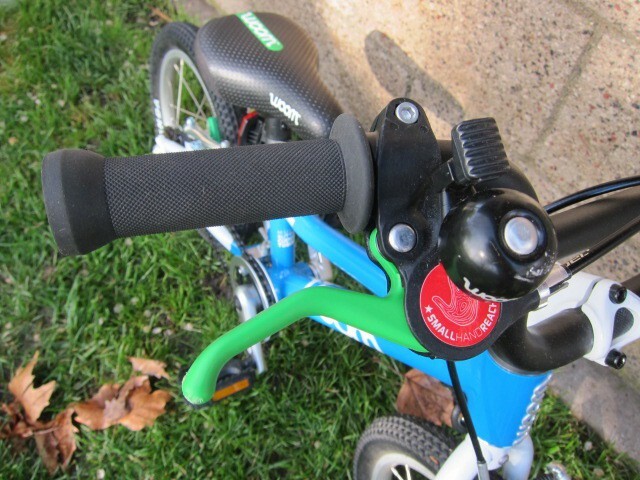 For young kids who are just learning the technique of braking, and who may not fully grasp right and left yet, this color-coding could very well prevent an over-the-bars experience. This feature is genius and shows that Woom has really thought everything thru in the design of this bike. The brake levers are also well-designed for little hands, and even my very petite 3 year old is capable of reaching and pulling them. We did need to spend a little time adjusting the position, but that is true of all bikes. 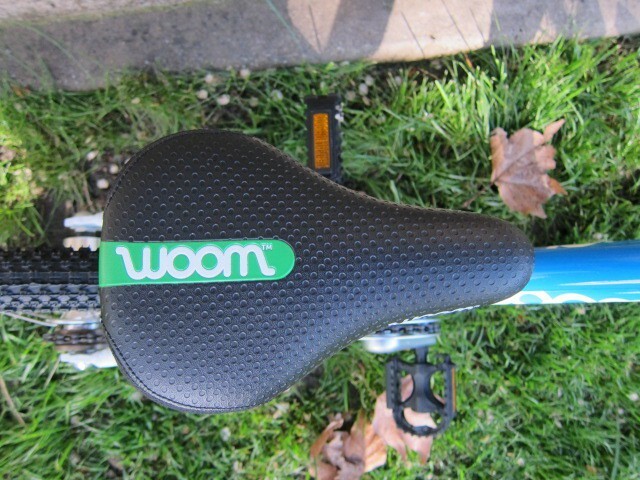 The saddle on the Woom 2 is a step above anything else I’ve seen on other kids bikes. It is comfortable, attractive, and well-constructed. Only time will tell how it will hold up long-term, but after a few drops and crashes it is holding up so far. 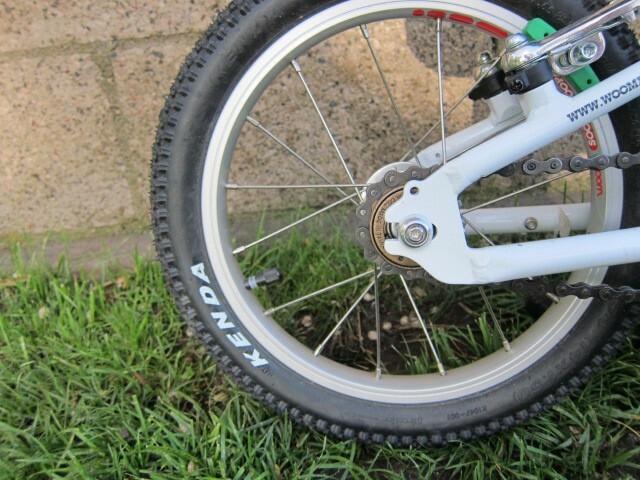 As a mountain biker myself, I love Kenda tires, so I was super stoked to see them on the Woom 2. We spend a lot of time riding singletrack, P included, and these provide the width and traction required for riding off-road. And for around-town riding, the low profile allows the bike roll with minimal resistance. Because Woom only sells their bikes online in the U.S., some assembly is required when you get the bike. I’ve assembled a good deal of kids bikes, and the Woom 2 was surprisingly easy. It was shipped with the wheels on and the tires inflated. I had to adjust the handlebars, install the pedals, and adjust the brakes (both the levers and the calipers). I tested the tire pressure, but they were good. If you have absolutely no mechanical skills you might want to take your bike to a shop for help, otherwise, the assembly is a breeze. For parents on a budget, $340 for a kids bike can be a bit tough to justify. My first bike in college was $300, for goodness sake. Plus, we are talking about a bike that is going to be outgrown in a year or two. All that said, I truly believe the cost is worth it. Just seeing how much my little boy’s riding improved after getting this bike made me realize why Woom can charge what they do. The second day after getting the Woom 2, he rode close to 10 miles. We had to peel him off the bike at the end of the night. To see that kind of enjoyment and enthusiasm in my child, I’d pay the $340 plus some. Although the Woom 2 is spendy, the quality of the bike justifies the high price. While I’m most concerned about the weight and geometry of a kids bike, this bike doesn’t stop there. The paint job is beautiful. I’ve received more than one comment from complete strangers on what a nice looking bike it is. Little details can be everything to young kids. 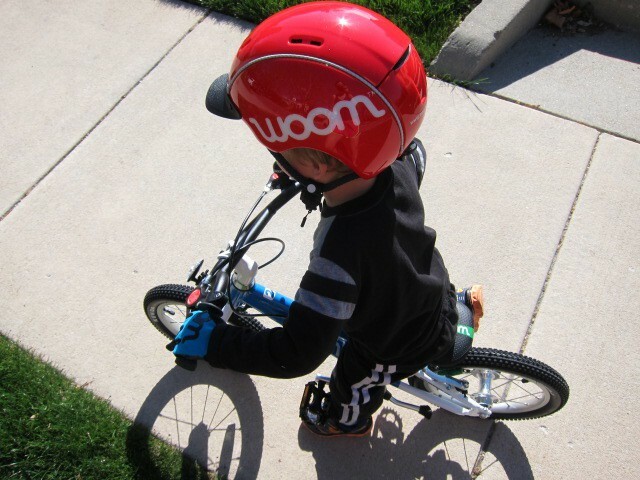 The Woom 2 comes stocked with a bell and a kickstand—both of which have been a huge hit with P.
Further justifying the price tag, Woom’s Upcycle Program allows you to trade-in your Woom bike for the next size up in their lineup once your child has outgrown theirs. Once you’ve ordered and received your new Woom bike, you send in the old bike and receive a check for 40% off the price of the new bike. Considering that Woom’s entire lineup is top-notch, this is a great deal. Other than cost, the only other (minor) con I see with this bike is that it doesn’t fit the tiniest riders. Although we are only talking about a small number of kids, some precocious toddlers are ready for a pedal bike around 2.5. If this is the case for your child and you don’t want to wait until they are 3 to get a pedal bike, consider the Specialized Hotrock 12” or Cleary Gecko 12” bikes instead. In addition to their rockin’ bikes, Woom also has adorable accessories you can purchase to complete the look. They sell helmets, gloves, bike locks, and more. After testing plenty of 14-inch pedal bikes, I can safely say that the Woom 2 is THE BEST option on the market. That said, if you want to do some more research, here are some of the Woom’s closest competitors. You may also want to check out our list of the best 12 inch and 14-inch pedal bikes for kids ages 3 to 5. 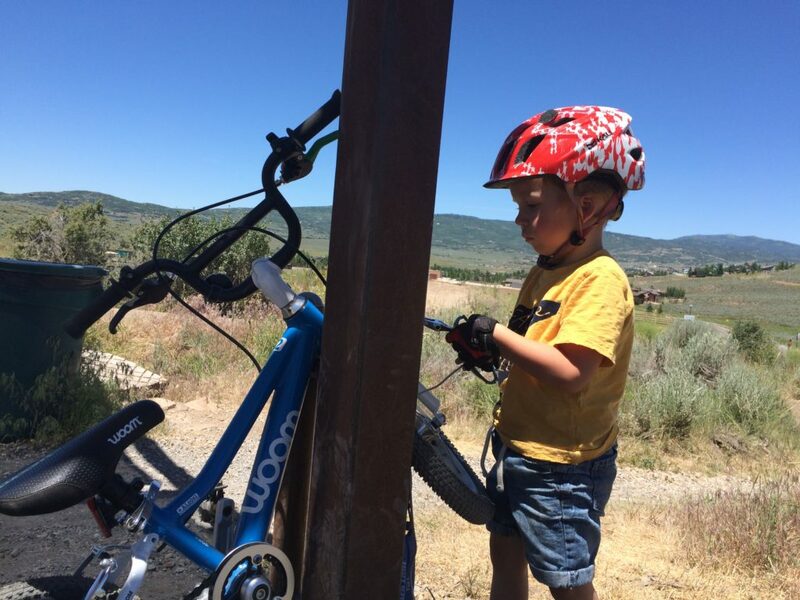 The Woom 2 is an intelligently designed, beautifully built bike for kids ages 3 to 4.5. The bike is a bit spendy, but in my experience, it’s worth every penny and then some. Compared to other bikes in this size range, the Woom is a huge step up. 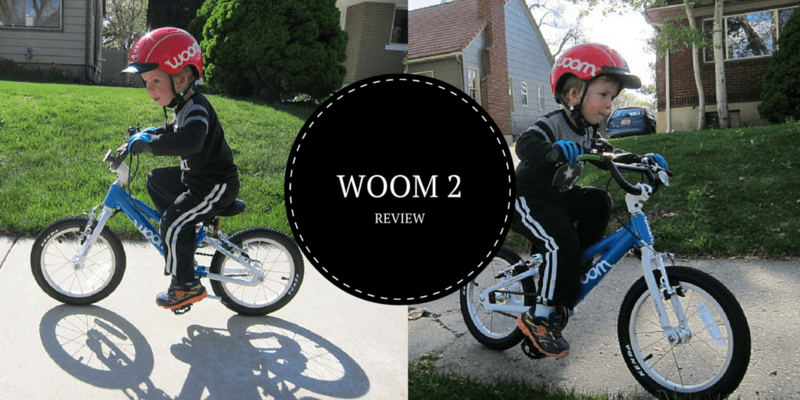 If you are looking for a quality bike that is lightweight, easy to maneuver, and that your child will love, you can’t beat the Woom 2.